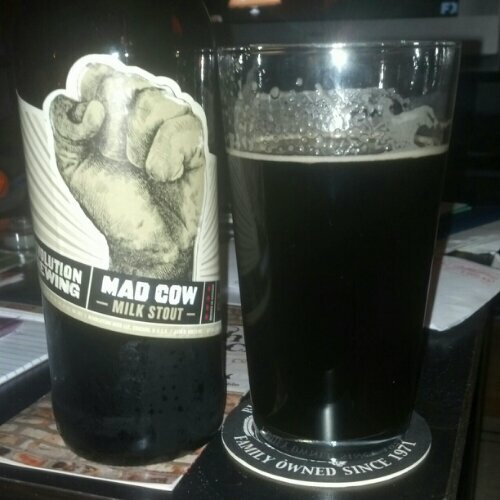 In this beer blog, we are going to get into another beer from Revolution Brewing and the beer is called Mad Cow Milk Stout. If you read my earlier blog on their Anti-Hero IPA, you know the history of this brewery. If you have not, please, read the first part of that beer blog post. Let us get into the beer. Revolution Brewing Mad Cow Milk Stout has a jet black color without a head on it. The smell is chocolate to toffee to the beer. The taste is a creamy chocolate beer without an aftertaste. It is pretty drinkable beer. In closing, I really enjoyed this beer and this is my favorite brew from Revolution Brewing. I love their Anti-Hero IPA also from this brewery. It is smooth and silky beer. It is extremely drinkable and that could get some people in trouble. I highly recommend this beer, however, this is not my favorite milk stout I have ever had. Mad Cow is my top five for Milk Stout.